Update: Winner is #55 - Nichole! She said, "This is adorable!! Grace would look so cute in it! :) Great job! And I love your blog!!" Welcome to May Giveaway Day on Quaint and Quirky! 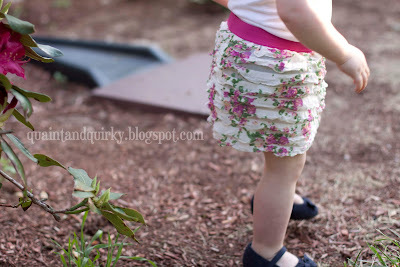 Today I'm giving away a lovely floral printed ruffled skirt. I've fallen in love with pre-ruffled fabric and I'd like to share one of my recent projects with it! Amelia's is getting a little too short for her now, but you can get the basic idea. The Prize: One ruffled skirt in your choice of size - 3 months to size 5 (you pick the size 3, 6, 9, 12, or 18 months, 2T, 3T, 4T or 5T). How to enter: Leave a comment. Any comment will do, but if you need a subject, tell me about an outfit that you love to wear. The contest will close Friday, May 25th at 3 PM and I will announce a winner by Sunday. Such lovely skirt! and adorable model Amelia:) would be lovely gift for my little niece. thanks for chance! adorable! love the fabric you picked! I love the vintage vibe of this skirt! so pretty, thank you for the chance, I have 2 little girls that would adore this! Adorable skirt! 5T would be great. My best friend's daughter could wear it, and when she outgrows it, my little one could then wear it. Perfect. OOOOOhhhhh pick me! I love everything you make :) Simply put. period. That is beautiful! I would need a 3T. It would be for my daughter, who is 3 years old, and then I would hold onto it for her baby sister, who is currently 6 months old. My granddaughter would love this skirt! It's so girly-girl like her! She would need a 2t if we win. Thank you for participating. What an adorable skirt...and model! Love it! I love this skirt. Do you find the pre-ruffled fabric fairly easy to work with? I've been wanting to play with it, but haven't yet. CUTE! My little Mariah would love it. You are so creative and crafty...I admire you and LOVE your blog! cute skirt! would look lovely on my little one :) thanks for the chance to win! Cuteness! I love the skirt. Right now I would love to wear a lot of outfits, but I'm expecting and so my favorite outfits right now are sweats and tshirts. I like a sweater with a knee length skirt and cable knit socks. Hi, Keri! I love the skirt and I know my girls would too! I have 4 girls who would all look lovely in this skirt!! That is such a cute skirt! Thanks for the giveaway! Hi Keri! I love this skirt! It is adorable! I know Amelie and Sophie would look so cute in it! so cute! I didn't know you could get ruffle fabric in such pretty prints. That is super cute; I never knew they made ruffled fabric. Unfortunately, my favorite outfit at the moment is jeans and a t-shirt. It's so comfy, and washable! I love to wear the new maxi dress my daughter gave me to travel in, wonderful! This is so cute! And oh-my-goodness -- Amelia is so adorable, and looking more and more like her lovely mama! oh my daughter would love one of those! And, it's funny, since having a pants-hating, skirt loving toddler in the house, I wear a lot more skirts too! Perfect! It's starting to get hot out, and my little lady could use this for all her outside time. Good giveaway! What an adorable skirt! Lately my favorite thing to wear is tee shirts,jean shorts and flip flops. I love flip flop weather. Thanks for the chance to win! I just had a baby girl and we named her Amelia. My older daughter loves picking out outfits for her to wear. Thanks for the giveaway! What an adorable skirt! My favorite outfit to wear right now is comfy jeans, Toms, and a loose button down! Thanks for the chance! This is such a cute little skirt, ruffles are so cute!! That skirt is ADORABLE! Oh my goodness... too cute. Precious! Thanks for doing a giveaway! I would love to win this skirt for my little one! I must go somewhere and find this pre-ruffled fabric for my daughter!! Or maybe I would be the lucky winner of this one and save myself all the trouble!! I love to wear this one sari from my in-laws... it's mustard and turquoise - not colors I'd normally put together - but the floral pattern is just excellent - looks like William Morris. It's pashmina, as well, and so soft... plus, saris are one size fits all, so I never have to worry about it being too tight or baggy! Oh how cute! I would love to win this. I would give it to my husband's cousin's new daughter! This would look adorable on my granddaughter! This is cute! I saw that fabric and wanted to make something with it, but I'm a bit scared to sew the ruffles. It would look so cute on my new baby girl that I due with in August. I love wearing maxi skirts! This skirt is too cute. Where did you get that lovely ruffled fabric? It's perfect for your project! Such an adorable skirt; it's a terrific prize. Thanks! This is adorable!! Grace would look so cute in it! :) Great job! And I love your blog!! In hopes that I have a little girl come November! ;) Love it!! I have one and I want another for the next size up. I LOVE it!!! My granddaughter would look so cute in that skirt! My favorite outfit right now is khaki shorts and a tank top. Very cute dress size 6 months if I win. Outfit I like is swim suit so I can go swimming. I pretty much just wear jeans all the time :) Thanks for the chance. Oh my goodness, that's precious!!! My baby girl would look even cuter in those! She'd probably need the 18m size. Our brand new granddaughter is just 5 days old so I would pick a tiny size for sure! Her Mama would love to start a collection of girly things, I just know! Thank you for your generosity! I absolutely love that skirt! so cute!! Lovely skirt! We are expecting our first grandaughter - it would be very well used! Very cute! I'm expecting a girl in 2 weeks!! Such a cute skirt my little darl would look so sweet in it! That skirt is the cutest. I just had two new granddaughters this year. Oh gosh. I swore to myself that if I had a daughter I wasn't going to dress her too froofy or make her wear pink all the time... and I have kept that promise... almost! I just can't help it - skirts like this one are adorable! I would love to see my little girl wearing this! I would love to win this for my niece Kameron! An adorable skirt... I can just see my 2 year old prancing around in it! Thank you for the chance at the giveaway! love the skirt - I have an adorable little friend who would love this. Such a cute skirt. Thanks for the giveaway! love this! Thanks for the giveaway. My favorite outfit is a pair of jeans and a striped fitted tee, but my 3 year old daughter will choose a skirt every day. Oh I've never seen printed ruffle fabric! Actually where we live there isn't any at all, but how cute is this skirt! Oh I wish I was small and cute enough to wear that skirt!! Gorgeous. What a cute skirt, my daughters are a bit big for it, but I'm sure my nieces would love it. :) My favourite outfit at the moment is tunic dresses which I can layer over jeans or leggings and long sleeve tees in the colder weather. My granddaughter loves pink. Anything pink. If you ask what color she wants, she will sometimes say red or blue or yellow. And that's fine, so long as there is ALSO PINK in it somewhere. She is so funny. What a cute skirt...WITH PINK!! Beautiful skirt (and model!) my favorite outfit at the moment is my winter jacket - it has turned a bit icy in Sydney Australia at the moment! I have 5 granddaughters and this skirt would certainly be loved by the lucky one who receives this as a gift. I am a yoga pants and t-shirt gal at home but my favorite out of the house outfit is a maxi skirt, white tee and denim jacket. This is so adorable! 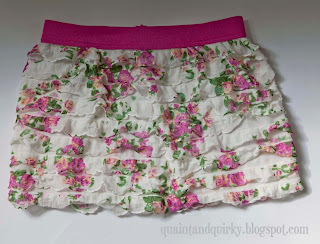 My daughter is really into flowers and ruffles these days, so I think she would love one! That's so cute! I love ruffle fabric! Such a cute skirt. My favorite thing to wear is jeans. I'm always comfortable in them. Too cute! I like anything that's comfortable! Wow, this skirt is so stinkin' cute. Put me in a skirt or summer dress and I'm a happy camper! The skirt is adorable. I love wearing gauzy dresses. I also have an "Emilia", but she is 19 and pretty tall! I do have a five-year-old named Claire-- she is all about the ruffles. So cute! I'm am loving Maxi skirts right now. So comfortable and cool for summer. Thanks for the chance to win! Such a cute skirt! I haven't worked with the ruffle fabric yet, but it looks so fun! My 4 year old daughter would love it! I love to wear cardigans...they are my fav! :-) Thanks again! I have a coral sweater I like with short sleeves and a v-neck. Thanks for this cute skirt! Will you be contributing to the 3rd one? OMG this would suit my grand daughter Emma to a T. Size 3T. She is my 4th grandbaby. The other 3 are in their teens, so I have gotten to start all over again. Love the frills. She is such a girlie girl. Loves to dance. My little girl is Amelia too. She is 21 1/2 months old. She is named after her great grandmother. Is your Amelia named after someone special. I'm a jeans girl but my 3 year old daughter loves to wear skirts or dresses, it's a real struggle to get her to wear pants! So cute! I haven't tried pre-ruffled fabric yet. More for my to do list! Thanks for the great giveaway! Thanks for hosting a giveaway! I have a great wrap dress that makes me feel happy and comfortable! My gorgeous girl would look delightful in those ruffles! Thanks for participating in giveaway day! 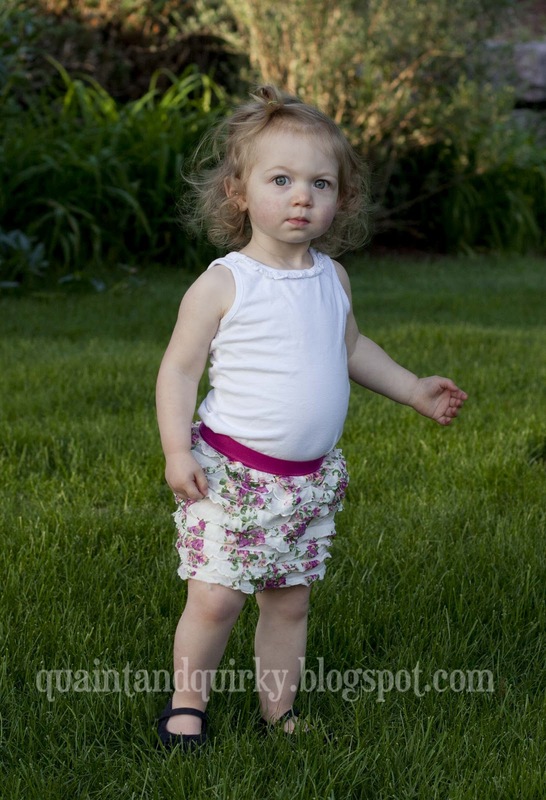 Great ruffle skirt, my little Hannah would look adorable in this! Thanks for the giveaway! I also love the new ruffle fabric trend. Super cute model! I have a silver sequined tank top that goes with much more than I anticipated when I bought it ! Adorable skirt! I love wearing my yoga pants, although never in public. Gosh, that is one cute skirt. My daughter would love it. It is freezing here in the Southern hemisphere. I am loving it. A chance to wear all my knitted beanies, scarves, wraps and cardies. Those ruffles are so cute. I secretly love my maternity clothes! elastic waist bands, stretchy clothes, not sucking it in... awesome! I love your skirt. It would look adorable on my baby. So cute! I love to wear crops and a vest like today, means it's sunny! my granddaughter (2) loves to wear pretty dresses and skirts. She would love this if I won. I love a good pair of comfy sweatpants and a tank top to wear around the house. i am jeans and t-shirt type of girl, I have a five year old girl that would love that skirt. With our hot weather, I live in linen all summer. Beautiful skirt! Thanks for the chance to win! I'm 26 weeks pregnant, so anything that is comfortable, keeps me cool, and looks half ways decent is a winner. :) Thanks so much for the chance to win such an adorable skirt! What a cute skirt. I love wearing skirts, there's nothing more comfortable. Adorable.. and that reminds me that I found some pale pink ruffled fabric last year, with the intent of a skirt for myself. It's almost summer - I should get to it! Thanks for the giveaway! Lovely skirt! I've never worked with preruffled fabric, let alone seen any in person. I would love to win the skirt for my daughter. my favorite thing to wear is a jersey knit skirt, just about knee length. Casual enough for the grocery store or dressed up enough for appointments. oh, and of course it has an elastic waist! I love to wear jeans!